November 22, 2018 by Julie T. Anné, Ph.D.
Thanksgiving is traditionally a time of joyful coming together; a celebration of gratitude, thanks and giving, amongst a warm and welcoming backdrop of family, friends and food. For those fortunate enough to have had positive memories associated with this tradition, the upcoming holiday is anticipated with enthusiasm and warm expectation. But for others, Thanksgiving represents one of the hardest holidays of the year. 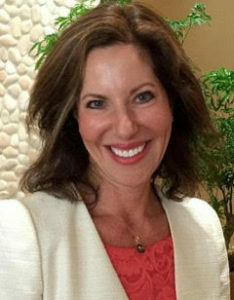 This is especially true for our clients at A New Beginning & TheHealthyWeighOut who are working to both recover from disorders associated with food and to heal from underlying issues typically associated with dysfunctional upbringings, difficult family dynamics, and subsequent struggles with interpersonal relationships. For these individuals, Thanksgiving conjures up anticipation of a day filled with dread. Dread for the emotional, interpersonal and food-based challenges that make them want to hide, either literally by retreating into isolation for the day, or figuratively through engaging in eating disordered behavior. Thus, this past week at A New Beginning & TheHealthyWeighOut has been spent in holiday-focused process, helping our clients to approach the upcoming Thanksgiving holiday differently. Working to not only “survive” the holiday, but more hopefully, to create a positive experience of internal and external joy, thriving regardless of past memories or of a history that may have fallen short of delivering Hallmark Thanksgiving moments. THANKfully now as adults, we all have the power to create the meaningful internal and external traditions we crave, in a manner that feels thankful and giving of joy! Here are a few points we’ve worked on throughout the week to help clients manifest the day they envision for the upcoming Thanksgiving holiday. Instead of disconnecting from your Self to “get through the day,” take some deliberate time before the holiday starts to connect with your Self, with the intent of identifying what YOUR needs are for the day. What conjures up warm feelings for you on Thanksgiving day? What tradition is important for you to experience? What is something you want to give to your Self on Thanksgiving (i.e., watching the Macy’s parade, time for your Self in the morning before heading out to be with others, permission to make a traditional food item that is important to you, etc.)? As you begin to identify what is important to you, head into the day with a well-defined PLAN for how to support your Self and to actualize what is important for you to experience. Too many times, we are aware of what we want, need, etc., but do not step into actively supporting our Self in ensuring that our needs, wants, priorities are met. This can then lead to feelings of disappointment, resentment and/or mis-use of food as a means to cope. Anxiety, while uncomfortable, is a most helpful signal that lets you know that a need, fear, or situation is operating under the surface. If you are having anxiety in anticipation of the Thanksgiving holiday, withstand the desire to disconnect. Instead, STOP and EXPLORE what is causing you to feel anxious. Then LISTEN, with the intent to step in and RESPOND to what your feelings, needs, fears are asking for and/or needing. Give yourself permission to nurture your Self, even on a holiday that is directed toward practicing gratitude and giving thanks to others. When we stop and tend to our Self, as well as the needs of others, we ironically have more positive energy to give back to others. Especially when you are struggling with an eating disorder, depression, grief or anxiety, it is easy to get absorbed in our own difficulties. Thanksgiving can be a great opportunity to practice putting random acts of positive energy out to others, which ultimately helps your Self. Smile warmly into a cashier’s eyes and pay them a genuine compliment as you go through the line at Safeway. Smile at a child whose parent is overwrought and is being short with them while waiting in line. Genuinely thank someone who is giving you service, letting them know that their help is appreciated. Focusing on others and putting positive energy out, as opposed to solely focusing on the negative within, is a great way to shift difficult emotional energy during small moments throughout any day. And Thanksgiving, is the perfect day to start! If you are struggling with the upcoming holiday, it is imperative that you not approach the day emotionally alone. Many times, we are around people who genuinely care and want to make the day positive for us. However, they miss the mark because they simply cannot read your mind. Clearly putting your needs out to others and/or asking for direct and clear help is one of the best ways to take care of your Self. If you feel obligated to spend time with family that are difficult and/or unhealthy for you, give yourself permission to set limits on the amount of time you spend with them. Before you go to the family event, connect to your Self and get a feel for how much time would be optimal to spend with them. Then, give yourself permission and a plan to leave after that amount of time. Examples of this might involve: planing on going to a movie with a friend at a specified time, planning a second dinner / visit with friends who feel more like positive “family” regardless of biological connection, making a date with your Self to do something fun and/or relaxing after the family-based Thanksgiving commitment. 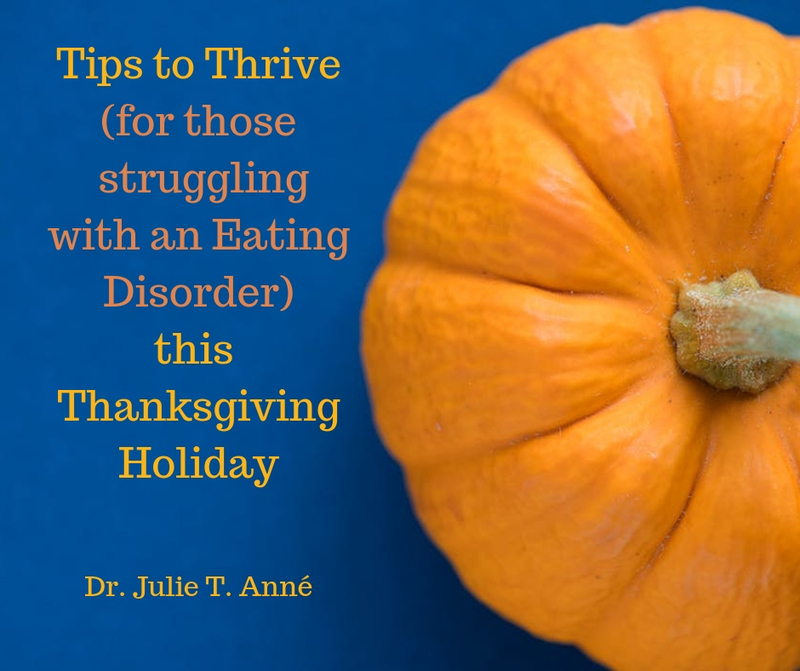 Many times, people who struggle with disordered eating emotionally retreat during the Thanksgiving celebration. Sometimes this turns into re-visiting the dessert table to thwart uncomfortable feelings, ruminating on eating disordered thoughts or behaviors following Thanksgiving meal, etc. Instead of maneuvering through these times alone, lovingly push yourself to interact with others. Play a board game, get to know a young niece or nephew better, invite someone to step out and take a walk with you around the block following dinner. Especially when you are working on eating disorder recovery, the Thanksgiving holiday seems solely magnified around the food aspect of the tradition. Instead of focusing on food, focus on the values-aspect of Thanksgiving. Focus your intent on Gratitude and Giving. When your head wants to go solely to the pumpkin pie, work to bring it back to your heart, focusing on what you feel grateful for this year, how you can give love and/or positive regard out to others, etc. If you are obsessing about what you will or will not eat, what others will be eating, or what others might think (or judge) about what you are eating, stop yourself and focus your intent on eating “intuitively” during the Thanksgiving meal. What is intuitive holiday eating? Allowing your Self to have satisfying amounts of the foods that you are really wanting, without judgment, guilt, or remorse. 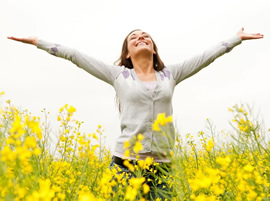 Taking amounts of food that will result in you feeling “happy full” at the end of the meal, without feeling uncomfortably full or physically unsatisfied. And, committing to step away from the table when you are no longer nutritionally hungry, and setting a loving limit with yourself to not step back to the table in response to emotional hunger. If you are currently “in process” of creating the happier, more fulfilling life you would like for yourself and are finding that, this holiday, you are still struggling with feelings of loss, grief, sadness or aloneness related to what you had hoped would be your life, it is easy to fall into the illusion that everyone else is “happy.” Social media can further fuel this inaccurate illusion, especially during times of holiday-driven vulnerability. It’s important to remember that happiness is never a static, all-or-none gift that everyone else is enjoying, except you. Instead, it is a flowing, always changing state that EVERYONE needs to work on and tend to regularly, in order to experience the happiness they desire. This holiday, commit to starting the process of working to create your own happiness; to start steering your own ship directed toward tending to your feelings, needs and Self. If you do, this holiday will be a Thank-full start to gifting your Self with future happiness, including happy holidays. This wouldn’t be a Dr. Julie self-care list without the inclusion of healthy, intuitive movement:) Moderate, enjoyable movement, directed by the intent to care for your Self, is always a positive way to support your Self through difficult times. This Thanksgiving, start your day by taking a walk underneath the beautiful sun-filled Arizona sky, bring gym shoes to the holiday dinner and introduce tech-obsessed kids to a game of tag football while waiting for the Thanksgiving dinner, and/or walk around the block following dinner as younger relatives ride their bikes or scooters in the street. it will clear your head, move you body and help your neurotransmitters balance for organic anti-anxiety and ant-depression properties! I hope this fun list is meaningful and helpful to all of you who are working so hard to heal, recover, and to create the happiness that you so deserve in life. May your Thanksgiving be driven by Love for Others, Respect for Self, and Gratitude for the Blessings that are present in all of our lives.